"Trick or treat!" That's the phrase shouted with glee by many a kid across the country every Halloween. But before your kids trick or treat this year, parents should keep in mind these trick-or-treating safety tips to make sure the only howls are those of fun. Have each child carry or wear something lit, such as a flashlight, glow bracelet or necklace, or flashing attire for visibility. Light-up shoes are also practical and ever-so-noticeable on a dark Halloween night. Adults should plan out a route in advance and check it during the daylight for such obstacles as broken sidewalks (or no sidewalks), construction timber, or other obstacles that could trip up trick-or-treaters. Require well-fitting shoes to be worn—preferably sneakers. While adorable in the store as a costume accessory, kids planning to go trick or treat should wear sturdy shoes and not the princess high-heel, too-large boots, or other types of shoes often shown with costumes. Avoid costumes that drag on the ground. While cute initially, costumes that drag can trip up little feet, get caught on bushes, and create a tussle that sometimes results in the child wanting to remove the costume. Pick costumes that are bathroom-friendly as well. On this same subject, parents should pre-plan a bathroom stop along the way (a friend's house will do and is a good time for a water break as well), or at a public facility if driving. Be sure a child's mask allows full visibility and breathing. Spiderman masks, for example, sometimes only have small eye slits and nothing for the nose or mouth. Parents should try on masks for size and not hesitate to cut out larger openings for a trick-or-treater's comfort. If possible, find a mask that "breathes" and is easy to put on and off. The types of mask that easily can slide up on the head and then pulled down are best. Only carry flexible props, such as knives, swords, ninja items, etc., that can't cause injury if a kid accidentally falls. No play prop should resemble the real item, and consider leaving play weapons at home and not part of trick-or-treat night. Only trick or treat at houses that are lit. Residents who do not wish to be bothered by trick-or-treaters often leave off their lights as a sign; respect their preference by only going to houses that are lit. Be sure kids don't get over-heated and keep hydrated. Plan costumes according to weather; don't have your child dress in an adorable lion costume with heavy fur and hood if you live in Southern states where temperatures could still be in the 80s in the evening; by the same token, a fairy costume might be impractical for a cold northern evening. Think "practical" over "cute" when picking a trick-or-treat goody bag or container. Some of the seemingly fun ones sold in stores are heavy—before any treats are added. Others are too long and will drag the ground or have sharp edges that could scrape against tender skin. One of the best and simplest suggestions is to have kids utilize a backpack to keep their hands free except for perhaps a flashlight. Keep track of time and don't trick or treat after 9 p.m. (general recommendation). That allows ample time for children to trick or treat, and by then, the excitement of the evening and the candy means little ghouls will be tired anyhow. Feed your kids a healthy meal prior to going trick or treat. Your children will be happier, and it will help reduce the temptation of kids wanting to devour candy from the first trick or treat stop. Children of any age should be accompanied by a parent, if possible. Tweens or young teens who still trick or treat may resist this notion; if they trick or treat without an adult, set firm rules and require a child to carry a cell phone that can be used in the event of an emergency. Older kids should know where they can go, what etiquette they must follow, safety rules, carry a flashlight or a lit device, and have an absolute deadline for returning home. Purchased costumes should be made of flame-retardant material. Costumes should also be reflective of the local weather. Some parents overdress their kids so that they sweat and are uncomfortable in costumes that are very heavy or don't "breathe." Others freeze in skimpy costumes or those made of thin material. Trick or treating is for children; comfort and safety should come before a parent's reluctance to have a child wear a coat over a costume. Insist that your child goes to the bathroom BEFORE leaving the house. And, be considerate of your child's bathroom needs by not choosing a costume that is difficult to get on and off in time to avoid last-minute bathroom needs, if at all possible. Never allow children to eat candy before it is inspected. Any opened candy should be thrown away, and unless you personally the families who make homemade goodies, it is recommended that you dispose of homemade treats. Immediately toss any items that are suspect in any way, and get rid of (either through donation or throwing away) any treats that your kid doesn't like. Some parents also put away some candy and save for later or set rules allowing kids to eat all they want for a designated period, then dispose of the rest. Pick up objects in the yard, sidewalk, or driveway that could create safety issues and be sure any tools are safely put away. Check hoses, flower pots, and extension cords. Think "trick or treat safety" when decorating. Safety experts recommend using a plug-in or battery-powered jack-o-lanterns instead of using a live candle. If you do opt for a live flame, make sure it is away from any possible exposure to trick or treaters' costumes or where they will be walking or standing. Keep your house well-lit and inviting, or if going for a spooky home theme, make sure trick-or-treaters know your house has a welcome-mat extended. Be sure your pets are secured and put away, or appropriate arrangements are made. Some pets become frightened; others may become territorial or even aggressive. You don't want your pets scaring trick or treaters any more than you want kids frightening your pets. Be especially careful with cats, who might dart out of open doors. Carefully consider treats such as healthier food alternatives than candy. Non-sweet items like crackers, chips, raisins, or popcorn could receive thumbs up from parents. Some also give the "treat" to trick or treat by way of pencil, spider ring, glow in the dark decal, etc. Child care providers often find themselves in the throes of Halloween excitement and fall fun. If possible, know the parents' wishes or expectations for their kids for Halloween when in your care. Obviously, this is easier for a provider in a home setting with fewer children than in a daycare with many. For some families, Halloween is not observed; others may insist on "non-scary" only. Still, others look forward to costumes and Halloween-type activities and encourage provider activities. Some providers work Halloween festivities into a storybook day, in which kids are invited to come in the costume of their favorite storybook. Others may have children make simple masks out of paper plates or fun foam, and have a fall party. One provider asks some of her closest neighbors to allow her childcare kids to trick or treat in the morning in costume; kids then return to the home for some special fun. Another has parents bring a special treat for all kids (which can be as simple as a plastic spider ring). Providers are so creative and can make the time around Halloween special and memorable, whether or not Halloween is officially celebrated. Providers can utilize some of the Halloween themes into a fun and enjoyable learning experience. Learning about bats and their habits, and then making a bat out of construction paper, perhaps with red glitter for eyes, can be lots of fun. So can watching a pumpkin be carved, and then the seeds be baked. One provider plants pumpkin seeds and then children enjoy watching the pumpkin "patch" grow and flourish in time for fall harvest. Some adventurous providers take children to pumpkin patches for free fun; others make arrangements for a short hayride or visit to the apple orchard. If costumes are to be worn, providers should insist that parents bring a change of clothing and also understand that accidents can and will happen on occasion. One provider lamented that parents of a 3-year-old brought her to child care in an exquisite princess costume, then became outraged when she tripped and ripped the hem. If parents don't want any possible harm to come to a costume planned for evening trick or treat, then perhaps an alternative should be brought instead. Costumes are often itchy, uncomfortable, or warm, and after the initial excitement of seeing friends in costumes diminishes, providers often change kids back into play clothes and perhaps celebrate with a fun fall frolic at a neighborhood park. One provider makes the day's lunch a special "unscary" and exciting treat, such as "finger" sandwiches, goblin juice (colored juice, witches noses (carrot sticks), and bats (jello molds). She says it is her favorite day of the year. Another has a special treat with the caramel apples, in which she carves out noses and face to look like a mini-jack-o-lantern and offers caramel dip with some sprinkles for kids. 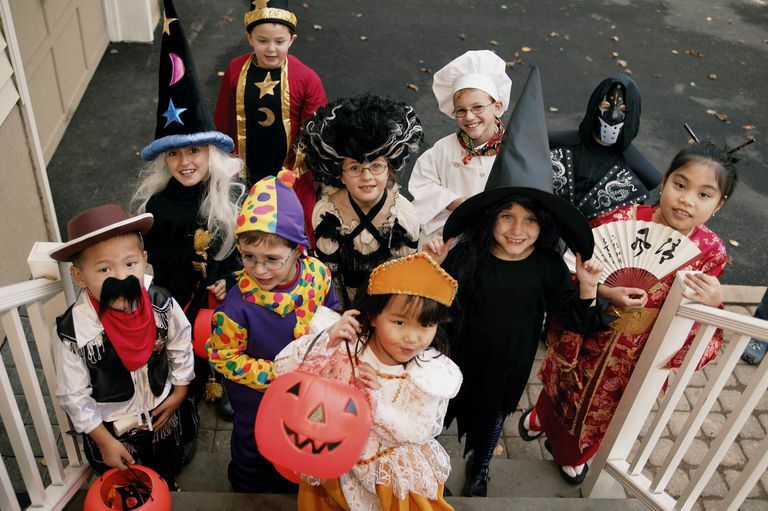 Other providers may opt to not do anything different and save the sugar-highs and costumes for parents entirely. Regardless of whether you are a parent of a young child, a resident who most likely will be inundated with happy ghosts and goblins, or a child care provider, the key to Halloween is to stay safe, have fun, and make it a "spook-tacular" activity for all.